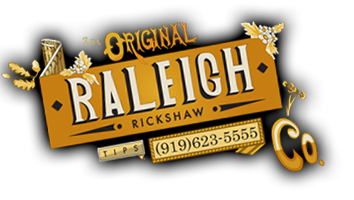 Couple Picnic Rickshaw tour - The Raleigh Rickshaw Co.
Want to have a relaxing picnic on the front lawn of Downtown Raleigh's historic capitol building? Let us take you there! Our driver will start by picking you up at your requested pickup location, whether that is your hotel, local house/apartment, or even your car wherever you parked it! Bring your own meal, or have us pick you up at the restaurant where you have ordered your food and beverage. Your driver will then give you a relaxing ride to the Capitol building and lay out our picnic blanket for you to enjoy. We'll return 45-60 minutes later, and give you another ride a before dropping you off at the destination of your choosing.